Time for another weird and wonderful round of my weekly Captured rubric. Today I'm presenting you the very genuine and unique doll of this week. What's on: LE Floral Spring Beret, Callie's Picks Stunning Falls Scarf, Pretty n'Love Rosette Choker, Endangered Species Tied Autumn Shawl, Young Hollywood Rihanna CFDA Dress, Callie's Picks Academy Awards Dress, Museum Mile Blush Tulle Slipdress, Archive Simple Maryjanes. 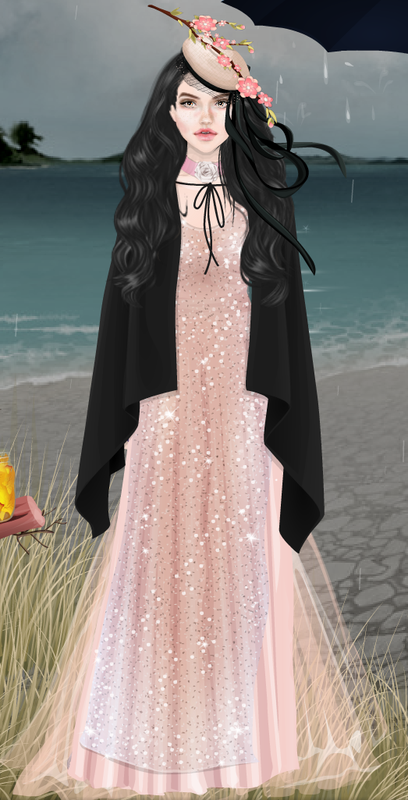 The reason I chose this lovely doll was her look that for some reason gave me Scarlet O'Hara vibes. I'm not exactly sure why is it so, but the only thing she needs is a Victorian-esque umbrella. I absolutely love how the pastel pinks have been diluted with the rather grim and harsh contrast of the shawl (one of my personal favourite items in general). However, she's not only known for dressing well, but she is also a great Stardesigner! Just look at her beaury parlor for the hair designs she makes and all those facemasks. Well, I'm definitely enjoying everything there is, if you ask me. Hopefully you enjoy this new Captured just as much as I do. As for me, I'm signing off.